Well, well, well. It looks like this sham of a display by your so-called Queen of Snark has come to an end. I, your esteemed Republican Informant (I can't believe she calls me that -- should be something like the "Duke of Truth," don't you think?) have decided to take over and present things the RIGHT way. You all have been misled for FAR too long! Allow me to show you the error of your ways, and teach you how we can steer this country back to its true, traditional, American values. 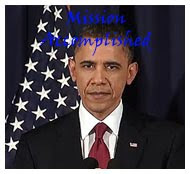 O ur esteemed leader Barack Obama declared "Mission Accomplished" more than a week after dragging our country into one of his pet interventions. His address to to the nation was panned by the media -- heck even the lefties over at the Associated Press called out Barry and his web of untruths. Now the big news is Obama has sent in the CIA to help train the rebels and direct NATO airstrikes. Through all this chaos, we should be glad to hear that the president is praying -- a lot. He keeps bringing up his Christian faith. Right... Okay, so what does the left have to say about their dear leader? What's next??? Are we headed into Africa? Is this all part of Obama's plan to call up his private health care army? On that note, observe Rep. Chris Smith was wisely spending your tax dollars to teach those Kenyans a thing or two about abortions. Hey Chris, did you get a chance to look for that pesky birth certificate? Liberals in Congress are trying to paint patriotic Tea Partiers as too extreme--too bad we caught ya Schumy! Just another example of a liberal smear job. The hacks over at the Washington Post are calling Speaker Boehner desperate for courting conservative Democrats in the budget battle. Hey, at least we have two bills in the works. How 'bout those Democrats? House Republicans introduced a timely resolution: the "Government Shutdown Prevention Act." We urge you to forget GOPers' past calls for a shutdown. Please, please forget. It's a fancy name, and more than just symbolism...we promise. If there is a shutdown, blame it on the Democrats for not listening to the American people. (Keep listening to the old man, Dean, though). And kudos to Michelle Malkin, for speaking the truth. Donald Trump may be running for president, but he's definitely not a top tier candidate after this week. Having to do a do-over to release your real birth certificate just makes you look stupid. If you want to read a fact-filled account of how Barry Soetoro pulled the wool over our eyes to illegitimately occupy the White House, pre-order Jerome Corsi's new book. It's sure to be a hit! And how dare Joe Klein describe the 2012 GOP presidential field as a national embarrassment? Once you've read his hit piece, you'd think that every last one of 'em is looking to be the next Justin Bieber. Joe, haven't you seen the incredible diversity and talent of our leaders? Obama's energy and climate legislation has basically gone no where since taking office. The last time he tried, jobs were destroyed in the Gulf, from moratorium on new drilling operations and more government oversight. And let's not forget about Copenhagen. Barry's calling for a 1/3 reduction of oil imports by 2025. If that's his policy goal then why does he want America to be Brazil's best customer? The flip-flopping continues. Redistricting battles are heating up across the country. A Tea Party freshman from Louisiana is being thrown under the bus by his fellow delegation "buddies" and may lose his seat come 2012. Our favorite Iowan, Steve King, may also find himself in a pickle. 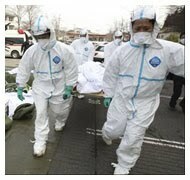 Tokyo Electric Power Co. says radiation levels in the groundwater beneath the stricken Japanese power plant are 10,000 times that of government health standards. Workers tasked in bringing the crippled reactors under control have told family that they're willing to die from radiation sickness in order to prevent further disaster. Now THAT's patriotism. Speaking of patriots, proud ones protested wasteful spending at a MASSIVE rally in Washington, D.C. by wearing colorful hats with hanging tea bags -- see that? Symbolism. The lamestream media did a poor job covering average Americans exercising their freedoms of assembly and speech. They even think the Tea Party is losing strength. We'll show them! As expected, liberal "bloggers" mocked the gathering -- you are tasteless, Wonkette. Oh, and go (Captain) America! The superb people at ICE are doing great work: they've proven to us that a 4-year old U.S. citizen was a grave threat to America's family values. Emily Ruiz was deported and sent back to Guatemala. By God, Louie Gohmert has been right all along! Watch out -- Big Sis is watching. The socialists down under are following in Michelle Obama's footsteps -- literally. Venezuela's Hugo Chavez says he's starting an anti-obesity campaign. We're guessing Venezuelans will be more "encouraged" to participate in this big government move. Will Michelle now reciprocate and take tips from the dictator to use in America? Real question: are they already in cahoots? The elitist Journolist crowd is now whining about a fluff piece by the NY Times (shocking!) about ANOTHER group of elitist yuppies. Oh, boohoo! Do you want a latte with that handkerchief? Meanwhile, gossiper Ben Quayle has it right about Politico. Maybe there's something something wrong with Kansas. A GOP state rep. has had enough! A new state bill would ban abortions after 22 weeks because there's no evidence that fetuses can feel pain after that threshold. Why should science be a factor in legislation? A new billboard is up in Barry's Chicago, and the locals aren't taking it well. Hey, at least there's no graphic pics -- we save those for the big rallies. Left-wing Planned Parenthood has been caught in another LIE. Just another example of why this organization has to go. Lila Rose forever! The unemployment rate fell to 8.8% as employers added 216,000 to their payrolls. We still have a longgggg way to go, especially with Democrats in charge. Liberal Hollywood actor Bill Murray is being cast as FDR. We're so enthused to see he's going to be playing the man who brought us the Welfare State. Gag. USA Today wants to know if YOU will be at the royal wedding. Huh? What now? Yeah, the Brits are tired of the American media, too. Food Network's "Barefoot Contessa" did a quick 180, or 360, or whatever. Anyways, she had agreed to host a 6 year old stricken with leukemia, after turning him down, TWICE. PR disaster averted? Oops, wait, but looks like he doesn't want to cook with her anymore. Too little, too late, Contessa. Rutgers University sank to new low. Snooki was paid $32k to advise students to "study hard, but party harder." Rutgers -- a pillar of America's education system. Mad Men won't be returning until next year. Don't even think about comparing the cast to the 2012 GOP presidential line-up! Grey's Anatomy tried Glee'ing it up for a turn. Yeah, not so much. Former White House Press Secretary Robert Gibbs is said to be feeling out a possible opportunity at Facebook. Facebook, we know you can do better. On the other hand, it would be a perfect fit -- a former official of an administration that only wants more control over our lives! Obama's first 2012 campaign ad is out! Brought to you by the NRSC. Next time, Daily Best, make sure you get it right, especially when you're tweeting about Gabby Giffords. Shameful. Shucks, the escaped Bronx Zoo cobra has been recaptured -- but not before it started his own Twitter account of his shenanigans. Microsoft, of all corporations, has filed an antitrust lawsuit against Google over an alleged search and advertising monopoly in Europe. Let the battle between the tech giants begin! When Obama is not busy robbing from future generations of Americans, he's robbing banks in Austria. The Pentagon's latest expensive "toy" will hopefully get axed. Spend the last few days enjoying the cherry blossoms; it would be so much better if the weather cooperated. Anyways, you can still attend free music and dance at the outdoor Sylvan Theater -- next to the Washington Monument. If you wake up a little earlier, the same venue will be host to a free yoga class. We'll point you to some other cherry blossom events, here and here. International Pillow Fight DaySaturday is also family fun day on the in the Capitol Riverfront neighborhood. Sushi galore and sake tasting! takes place on the National Mall and at Dupont Circle. Be nice? National Geographic is hosting the film series Women Hold Up Half the Sky, which runs through tomorrow. Films are by women from and about international, indigenous cultures. Today is also the last chance to see the New York Avenue Sculpture Project at the National Museum of Women in the Arts, on New York Avenue, of course. ForwardFest DC is in town -- a celebration of electronic music. Come watch performances and participate in workshops. How would we rate the past few years of the Turner Report? Dreadful. Just dreadful. You may have though you were getting the real deal, but we hope today's report has thought you a few things about patriotism, America and freedom. Has Stephen Colbert agreed to mentor you?